The importance of Facebook to businesses (particularly local) is no longer a question. The ease of setting-up Facebook Pages, and the promotion opportunities around them, are so accessible that for more and more businesses it’s ‘Facebook first, website second’. First or second, no matter how you cut it, this means double the headache. Until today. For companies that choose to go ‘Facebook first’ a new product by EXAI makes it a snap to go ‘website second’ by auto-magically converting their Facebook Pages into full-blown websites — with mobile versions to boot. If you haven’t heard of EXAI you’re not alone. The company has kept a low-profile even in Israel where it’s based. It seems though to be employing a team of 50 and is backed with $15M in private funding, $3M of which the company claims to have been added recently. The company’s core product is a drag-and-drop website creation tool (think Wix & SquareSpace) that has generated 15,000 sites since it first launched four months. The Facebook-Page-to-Website product is an extension of the company’s core product, and the one I would argue faces considerably less competition against in terms of marketing. Here’s how it works: Once users log-in to EXAI via its Facebook app, they are presented with a list of Pages that are associated with their Facebook account. After the desired Page is selected, the EXAI editor renders a variety of website options for it based on the elements (text, photos, videos, etc.) that are part of the Facebook Page being rendered. These range in graphical themes, colors, fonts, layout, and elements included, for example, photo galleries. There are literally hundreds of permutations. Users can also manually customize if none of the automatically generated options are to their satisfaction. 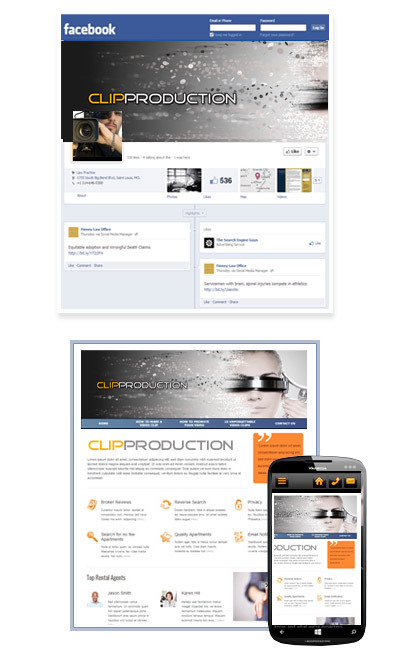 Here’s the resulting website that was converted from my investment firm’s Facebook Page. Bear in mind that I purposefully didn’t edit the result in order to show the automatically-generated first version EXAI produced. The one visible kink is the header image (and I can easily fix that through the Editor). Here’s another example, and its Facebook Page original. At the moment, users will need to use EXAI’s editor to update content after the initial conversion. I was told, however, that automatic content updating from Page-to-Website is coming in the near future. A really nice bonus is that all EXAI-powered sites come with mobile versions optimized for smartphones. Tablet-optimized versions will likely come down the road, but in the mean time they are served the standard Web versions. My two main product gripes are the quality of the website editor which can surely improve (especially compared to Wix & SquareSpace). Also, the automatically generated themes can do with a quality overhaul as well. That said, it’s solid enough for a product out of the gate that’s aimed at small businesses. Unsurprisingly, EXAI is employing a freemium model. There’s a single premium option that ranges from $3.50-$6.60/mo, depending on the length of monthly subscription chosen. The one size fits all premium tier includes such features as: Additional design customization options, hosting on a custom domain, as well as unlimited storage and pages. If you’re a small businesses with a Facebook Page and the idea of creating and maintaining a website seems daunting, I recommend checking out EXAI. It might not be perfect, but it’ll do quite well for most.